Genuine worship is a gift. 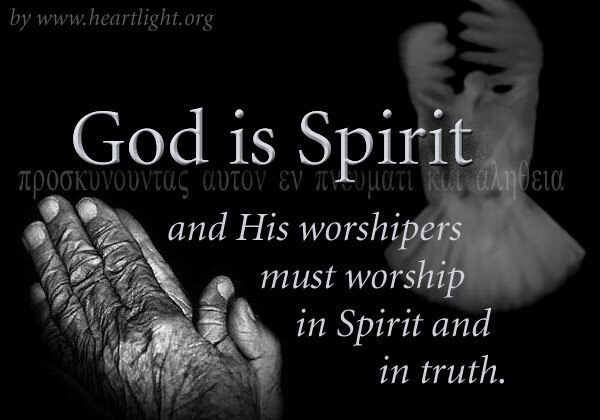 Since God is spirit, since he is holy, we cannot fully approach him without the gift and blessing of his Holy Spirit. As Christians who received his Spirit when we were baptized into Christ and born of God, we can now speak to him and worship him Spirit to Spirit. Abba Father, by the gift of your Spirit I come to you as your child. Thank you so much for giving me your Spirit so that I can approach you with confidence and know you hear the concerns of my heart. Please accept the worship of my heart, of my words, and of my actions. May the things I do today bring you glory. In Jesus name I pray. Amen.